Are You More Likely To Give to a Homeless Person If…. …They ask for a specific donation amount? This homeless man at Union Station in DC just asked if I could spare $5 dollars and then in a lower tone he said or a couple of dollars? Since when do bums get to set the price of donations? I mean I know the cost of living in DC is high but, is that acceptable? And what if I gave him loose change what would he do reject it? I won’t be surprised if these people start excepting debit cards soon. Get Your Affairs In Order…. …Because you never know what the future holds for you. Recently, on an episode of the Wendy Williams Show, Star Jones shared the tragic story of her friend “Rhonda” who was murdered leaving behind 3 children. Star’s promoted the website/blog NAPW that hosted a great guide for any person on how to make sure their affairs were in order should they die or become incapacitated. It doesn’t matter how much money or assets you have because it’s also important to ensure that your family or loved ones know how you want to be memorialized i.e. buried, cremated etc. Here is an excerpt from the post. Write a will (and update as your life and circumstances change). Create Testamentary Trust for any minor children (if necessary). Record information about your lawyer, accountant, financial planner or financial advisor, including his/her contact information. Write a letter detailing what you want done with your personal possessions after your death. If you want a niece to have your engagement ring or your god-child to have your precious pet, put it in this letter. Give a copy of the letter to your lawyer and have it notarized if necessary. Establish durable power of attorney to direct assets and investments. Write a living will or a health-care proxy (medical power of attorney). List all your pets, include their veterinarian names and vaccination history. Specify who should have access to private/personal information (computers, passwords, finances, etc.). List all irreplaceable items that are locked up (either in your home or in a safety deposit box) including jewelry, heirlooms and documents such as marriage license, birth certificates, passports, stocks, bonds and death certificates. Make a photocopy of those documents for your household files and consider taking pictures of the jewelry or other items. Find a safe and easily accessible place for your important documents. Identify and document the location of home desks, hidden cabinets and drawers, home safe with combination or locks and any other non-obvious document storage locations. Include name, address and keys for storage lockers. Take a physical inventory of items worth $100 or more. A list of all regular deliveries such as newspapers, milk and all regular service providers such as lawn services, waste pickup and snow removal. Discuss plans for death with your heirs and/or close family/friends to prevent disputes and let them know your expectations. If you wish to be buried, buy a burial plot or secure a mausoleum. Send any lists and or wills to the estate administrator (dated and signed), give one to your spouse/family member and keep one for your records. I have to admit that I’ve only had Shrimp and Grits three times in my life. The first time being the best and only about 2 months ago. The best Shrimp and Grits in the DMV according to a lot of people…(don’t think I can be a great judge only having had it 3 times)… is at Marvin in Washington, DC. I went to Marvin’s at the recommendation of a friend and was told to try the Shrimp and Grits. I obliged but I hadn’t really realized that it was listed as an appetizer. My friends and I all got the same thing. It was close to closing time and once the food arrived I quickly regretted not ordering two servings. It’s not really a small portion but as I said I was starving. Marvin’s serves their dish with the shrimp heads attached. So if you are squeamish about your food looking back at you, maybe ask for them to be removed. This Shrimp and Grits was the best thing I have tasted in a long time. Two weeks ago I had a slight craving for Marvin’s but once we got there, we realized the wait for a table was 1 hour. Reluctantly we went up the street to Busboys and Poets. Someone had mentioned that their Shrimp and Grits was pretty good. I guess I should have known better when the menu listed grit cakes and shrimp. First off… grits should be creamy not cake-like. And after tasting it I was sorely disappointed in the dish. It wasn’t horrible but it certainly didn’t measure up to Marvin’s dish. I left there upset that I didn’t get what I wanted. Fast forward a week and I happen to be watching an episode of The Steve Harvey Show that showcased a similar Shrimp & Grits recipe. It had to be a sign right? So I decided to whip up my own rendition of Marvin’s famous menu item. My recipe is similar to the one featured on the Steve Harvey show but I added diced sausage to it. I can’t remember if Marvins’ recipe has bits of bacon or sausage. Saute the onions and garlic. Add the diced sausage and Worcestershire and stir. Add the shrimp. Add seasonings. Turn the shrimp once they begin to turn pink. Set aside the shrimp and start the grits. Stir in the grits and reduce heat to low/simmer and cover, occasionally stirring. Serve the grits garnished with the shrimp and sausage mixture. Does the Lack of Respect, Responsibility, and Recourse Correlate to Absentee Fathers? Father’s Day recently passed and with that holiday usually comes comparisons of the roles of mothers and fathers. But particularly the overwhelming scrutiny of the absence of many men who have fathered children (at least in the biological sense). Mothers in our society are very often celebrated, but fathers on the other hand don’t receive nearly as much praise or recognition on the same level. But when we observe a standup father doing a decent job, we tend to overcompensate as if him being a father is some amazing feat. And not something generally expected of him. I’m not saying that fathers should not be celebrated but just that we should uphold the fathers to a standard similar to that of mothers. It’s no secret that America is plagued with a disproportionate number of families living without a “present” father than those who have a two-parent (male and female) household. I think that has a lot to do with our society in how women are portrayed in media. I’ve written on that topic previously. While this isn’t the only reason for the imbalance, it certain is a contributing factor. But that’s not to wholly blame women for their actions but equally to share in the blame are the men who perpetuate it. If we think about the Baby Boomers’ parents, we typically think of two-parent households and marriages that really meant “til death do you part” but somewhere in the last half-century or so, things changed. Many of my friends close to my age have parents that never married. So somewhere between my grandparents’ generation and my parents’ generation, family values, family make-up, and family dynamic seem to have drastically changed. Can promote the seeking of affection from outside sources. In my humble opinion, I think that men who knowingly father children but choose not to participate and help raise their children, often feel no responsibility to the child or the mother. Which in some cases stemmed from a lack of respect for the woman/mother. And because there aren’t strong measures in place for any recourse for absent fathers this cycle continues. This post is geared mostly towards parents that had a short-term relationship prior to the child’s conception. That’s not to say that the children of married folks don’t suffer from some of the same issues. Respect is generally earned, so it’s rare to truly respect someone you’ve known for only a few hours. In cases of one-night-stands and relations with those you don’t know very well, you do yourself a huge disservice by not refraining from engaging in intimate acts at least until both parties are a bit invested. Here’s where I put a bit of the blame on the woman since in most cases that’s where the respect issue begins. People can only do what you allow them to. So in those intimate moments–if the woman had respected herself in that moment to refrain from engaging in that act, the man would have no choice but to do the same. This is more of a combination of the media portraying women who put themselves on display in a disrespectful manner and women and men who condone and perpetuate that. In the end, us women must do a better job of respecting ourselves if we expect for men to do the same. Because a man who respects a woman who bore his child would never want for that woman or the child to suffer or do without because of his lack of participation. Studies show that the non-existence of a committed relationship significantly increases the chances that the male will be less likely to be a contributing parent to the subsequent child. If a man has no obligation to a woman (such is the case in any committed relationship) he is much less likely to be around once a child is born. He feels no responsibility or commitment to the mother and therefore no responsibility to the child. Sometimes, if you can observe someone long enough from your interactions with them you can assess their “responsibleness”. Do they pay their bills on time, do they respect others, do they abide by rules and laws, are the respectful of time etc. These won’t be a 100% determining factor but you’ll get a sense of who they are. But in a lot of cases, if the person is generally a responsible person and they become “a ghost” after the pregnancy/birth of the child, then chances are the real reason he left was sheer fear. Perhaps fear of not being a good father, fear of not being able to financial support another individual, fear of all the changes that will surely come with a child and a million other fears. Expecting mothers have many of these same fears for themselves and their child. So this doesn’t excuse the father. Seemingly the only recourse that a mother has to tie the child to the father is financial child support. Child support can be a deterrent for fathers to be active parents for two main reasons. The first is that they feel that their obligation is met because of his financial contribution. The second is that they resent the mother so much for garnishing their wages or altering their lifestyle financially that they punish the mother (and ultimately–really, the child) by not spending time or actively engaging with the child. Additionally, they also may not feel any obligation to pay child support, knowing that there are many men who never pay and have commonly not been persecuted for it. Therefore, if a man has no respect for the child’s mother, lack of responsibility for the child he created, and feels there is no real recourse that forces him to take an active role, then what motivation does he really have to do the right thing? Most importantly I think that if men who knowingly father children would just be real MEN by adding value to their child’s life. Make that child a priority it’ll be so much more rewarding than imaginable. That fear that most expecting parents have should not deter anyone from doing what is right. For fathers who currently have children and are not participating, step up! You’d be surprise how being a father can positively affect your life and the child’s. Children are a blessing not a burden! The bottom-line is that you will never really know if someone will stick around after a pregnancy. But you can do what is in your power to give yourself and your child the best possible chance to have a fulfilling relationship with both parents and the family live that he/she deserves. The Maryland area has great wineries. And with those wineries comes Wine Festivals. They start as soon as the weather breaks and it’s a fun experience. I had been wanting to go to a real wine tasting and wine festival for years, but I didn’t make it to either until last year. A few weeks ago probably the biggest wine fest in Maryland was held in Columbia, Maryland known as “Wine in the Woods”. The name may sound scary but I hear it’s a great time and an event not to miss. Unfortunately, I missed it. Not intentionally, however. I had pre-purchased my tickets but it turned out that my aunt’s funeral was being held on the same day in Philadelphia. The weather wasn’t so cooperative for the wine fest this year anyway. Wine in the Woods has many local wineries so you get to taste different wines from around the area. 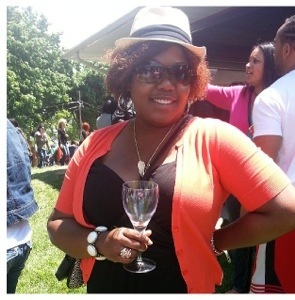 More recently was the Caribbean Wine Festival in Mount Airy, Maryland at the Linganore Winery. They have a really good sweet white wine (dessert wine) that I like called “Sweet Chessie”. Sweet Chessie can only be purchased at the winery, as most of their other wines can be purchased in stores throughout Maryland. It’s $16 and comes in a super skinny bottle. I’m sad that I didn’t get to buy a bottle to take home. By the time my friends and I were ready to leave the lines for purchasing were ridiculously long. I remembered that they gave out stem-less wine classes last year and decided to bring my own glass from home. I secretly want to be a wine-snob, but until then I will share what little I know. Most importantly, the wine glass design is essential for enjoying the perfect glass. No-0ne likes fingerprints on their wine glass. For a little light reading check out The Anatomy of a Wine Glass.